The production of new units and research of new technologies can be done during the game. 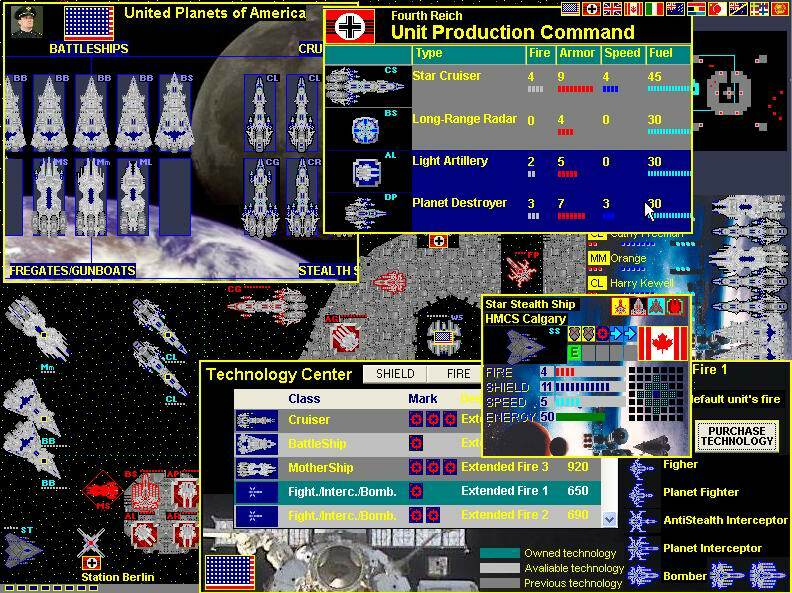 Game objectives are various: you can conquer enemy space stations, destroy enemy units, defend stations, and secure cargo convoy to the friendly station.Player can choose between 12 nations, including United Planets of America, Worlds of Canada, Fourth Reich, United Stars Kingdom, Australian Planets, Great New Zealand, Chipan Empire and Soviet Socialist Planets. space, strategy, war, game, space ship, spaceship, World War IV, Space War, battleship, stealth, space cruiser, bomber, fighter, interceptor Space strategy game, Battleships in Space.Game contains missions, death-match and free hunt scenarios & campaigns with more than 60 ship, death-star, stealth, fighter, artillery, radar unit types, and allows using 100 combat technologies.